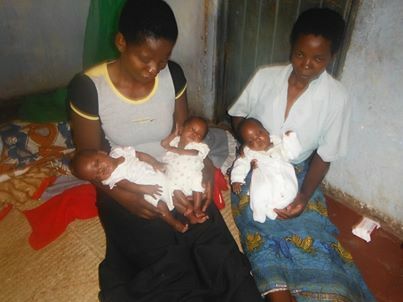 Triplets Trinity, Triphonia and Treeza were born in Chilomoni Township in November 2013. With three other children in the family, and no income, severe financial difficulties caused major concern to the Child Welfare Team. Mother Teresa Children’s Centre, were approached to help. This Krizevac funded centre has been able to provide clothes, beds, bedding, a three-seat pushchair as well as formula milk needed to help these three in their early development. Jane from the Outreach Team, checks their progress regularly and makes sure she finds time for a quick cuddle too! Jane is one of the many graduates of our Diploma in Early Years Development and Professional Childcare, which was written and delivered by UK volunteers. We’re seeking more volunteers who are Early Years specialists, please do get in touch if you would like to find out more.